I was raised in southern Ontario and graduated from the University of Western Ontario. After living in Ottawa and Edmonton, I moved to Brandon with my family in 1972. I was rescued from a life of aimless teaching and research at Brandon University by my wife Barbara and daughter Shahna who allowed me to live among their large collection of fostered and adopted cats, dogs and horses. I was aggression tested for other animals and once found suitable I was allowed to do veterinarian runs for Furry Friends and to walk dogs so long as I didn't bite people. Ultimately, I bonded very strongly with the world's greatest dog, Ricki who chose me to care for her after Shahna's death. My wife and I continue to maintain the strong association of Funds For Furry Friends with the Brandon Humane Society and Tracy Munn, Shahna's great friend there. D’Arcy Barker is a founding member of the Board of Directors of Funds for Furry Friends. He has served as the Chief Financial Officer since the inception of the Corporation when Shahna Rice was the founding President. ​D’Arcy is a Chartered Financial Planner and Registered Employee Benefits Consultant and brokers for Canada’s leading insurance and investment institutions. 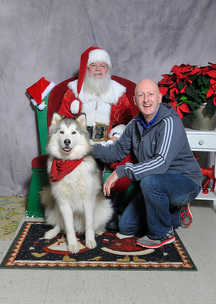 D’Arcy is a proud Foster Dad for Funds for Furry Friends and also a very proud Dad to his Alaskan Malamute, Beyonce! Theresa’s involvement with Funds For Furry Friends goes back to the early years of FFFF and she has been very active in the rescue through volunteering, fostering and serving on the Board of Directors. When Theresa moved to Brandon, she befriended FFFF founder, Shahna Rice. They bonded through their mutual love of animals and Shahna became a great friend and mentor. Shahna had a dog that needed a foster home and Theresa’s FFFF foster career soon began! Theresa especially enjoyed fostering expectant mother dogs and moms with litters of puppies whenever possible. With the support and help of her husband Dave and daughter Claire, Theresa welcomed many wonderful foster dogs into their home including Penelope Beagle, their ONLY “foster failure”. They decided to officially adopt Penelope in 2005 and she’s still enjoying life as an ambassador for rescue adoptions. Theresa and her husband have since moved to Ottawa but FFFF will always have a piece of Theresa's heart. Jill has volunteered with animal rescue for over 10 years and began her journey with Funds for Furry Friends as a volunteer driver for vet runs. She has transported 100’s of dogs and cats. After years of volunteering in nearly every area of the rescue, including handling dogs and cats, fundraisers, administrative, vet runs and more, Jill accepted the role of Vice President in 2011. She left the Board a short while later to focus on family, but was still heavily involved in Administration and other volunteer activities. With the big changes that happened to the Board at the end of 2016, Jill accepted the role of Director to help with the transition while upholding the values held dear by FFFF’s founder, Shahna Rice. Jill and her family have fostered over 40 dogs – from a 7 lb Maltese to a 100+ lb Newfie mix – and adopted Ringo, one of their fosters, in 2011 who can often be seen at her side during events and visits to schools, University and more. ​Mandy, of Mandy Wark Photography, adopted her dog, Marshall, in late 2011 from Funds for Furry Friends. She kindly offered to photograph our animals and a relationship was formed in 2012 and to date, Mandy has photographed over 200 dogs, puppies, cats and kittens, three calendars, as well as attending and shooting various events over the years! Her generous actions extend to other areas of the rescue and she and her family have helped out in so many ways, including fostering, fundraising and more!